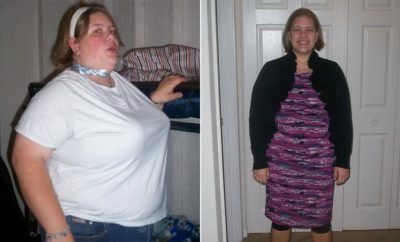 How I Gained It: I’d been trim and fit pretty much my whole life, but then something changed: I started working from home. My job involves sitting at the computer all day, so I began putting on ridiculous amounts of weight. I was so busy, I didn’t notice or even care that I was eating too much — in fact, food helped me deal with stress while I was working. When I was feeling stressed, I reached for the cookies. And it wasn’t just stress that caused me to eat — when everything was going well and running smoothly, I’d have a mini celebration with a cookie or a piece of cake or something sweet. I always had some way to rationalize my poor food choices. Were bread and butter more important to me than looking good and feeling healthy? The answer was no. I wanted to be the lean, athletic girl I used to be. It was then that I decided to give up the sweets and start walking. 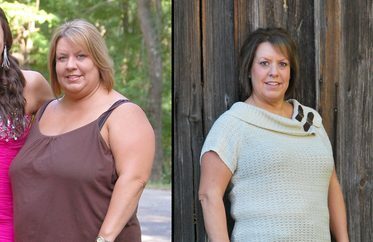 How I Lost It: I’ve always loved walking — it gives me energy and always helped me manage my weight in the past. So naturally, I started walking again. I began slowly. I would walk in the morning with my dog and then at noon and after dinner — they weren’t long walks, but they were long enough to get my heart pumping and get me energized. I would walk at a steady pace — not too fast but not too slow either. As I got used to walking again, I noticed it did two things for me: It gave me exercise that I desperately needed, and it helped me take my mind off food and work. When I got home after my walks, I didn’t head straight to the pantry — in fact, I usually wasn’t even hungry! As I got used to walking, I started challenging myself by speed walking, adding weights and even running from time to time. I have a weighted vest from NYKNYC that I usually wear, and it’s done wonders for helping me burn fat. I walk 20 minutes in the morning, 45 minutes at lunch and another half hour after work. When I don’t feel like walking, I find the music helps motivate me. As I began to get healthier, I noticed I was making better food choices, too. I seemed to lose the urge to gulp down sugary or fatty junk foods, and I cut out bread completely. Nowadays, my diet is mostly lean meats and veggies, but I do treat myself to dessert most days. The difference is that now I can enjoy just one or two cookies — not several. I also allow myself one cheat hour a week — usually it’s on Friday. Nothing’s off-limits during my cheat hour — even a gallon of ice cream! After the hour is up, it’s back to healthy eating again. The cheat hour helps satisfy any junk food cravings I have. My No. 1 piece of advice is this: Don’t give up! You can lose weight — it just takes a bit of effort at first, and after a while, you’ll start to look forward to it. 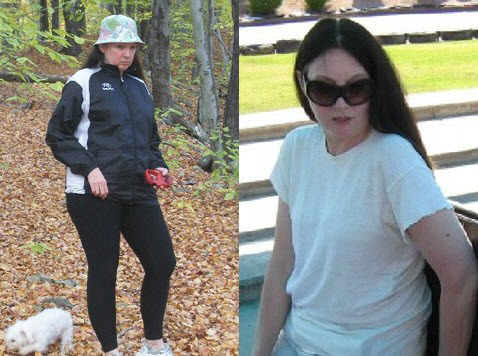 Making only slight adjustments to my lifestyle helped me lose 50 pounds, and I’m still losing! Suzy still walks rain or shine and is watching the numbers on the scale as they continue to fall.